Keep your wire marking labels organized with Ladder Shrink Tube. Made from a halogen-free polyolefin, this tough material offers long-lasting binding around bending, twisting, and variable temperature wires and cables. The shrink tubing is pre-cut into lengths of 2" and arranged on the roll similar to rungs on a ladder. 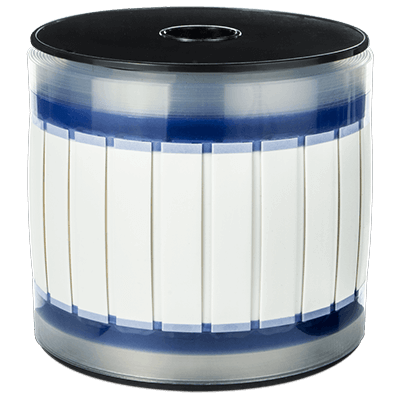 The layout provides an easy-to-use format for creating sequenced batch files, where individual shrink tubes can be separated from the carrier as needed. It improves organization for large wire marking projects by simplifying the label creation and application process. When heat is applied, the tubing shrinks to a third of its original size, encapsulating wire splices or wire bundles for insulation and protecting against abrasion and other environmental conditions. Meeting UL, CSA, and military standards, the flame retardant tubing is ideal for server rooms and other environments where cables and wires must be organized and easily identifiable. This durable supply can be used in environments between -67°F and 257°F, meets VW-1 flammability tests, and is Restriction of Hazardous Substances (RoHS)-compliant.